If you know me even a little, you would see that I'm honestly shy at heart. I prefer conversations with just a handful of people as opposed to big groups. Public speaking gives me heart palpitations (still!) & I am most comfortable being behind the scenes. Putting together the Makerie has been a huge growing experience for me in all of these areas, and continues to be! We all need to be challenged in life and I am thankful that for me, it can be through doing something I love and believe in with all that I am. 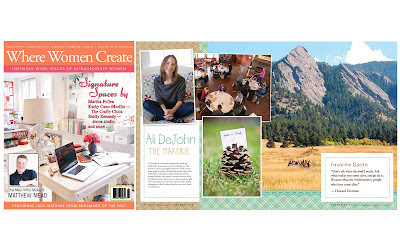 Needless to say, I feel incredibly blessed to be part of the latest issue of Where Women Create (on newsstands now). It's an exciting, wonderful honor to be in a publication that I have loved and read for a long time and to be featured among people I admire so much. (Gosh ~ pinch me please again!) A most heartfelt thank you to Jo and her team for believing is us enough to share our story. I am grateful from the bottom of my heart. Yay for you, Ali! That's wonderful!